We are located on Jefferson Avenue in Detroit, about one half mile east of the Renaissance Center and close to the Detroit Riverwalk. If heading east from downtown, the large Blue Cross-Blue Shield billboard marks our back parking lot. Easiest access is from Jefferson Avenue. Turn onto Rivard Street (toward the river). Take the first right from Rivard onto Woodbridge Street, where there is church parking. 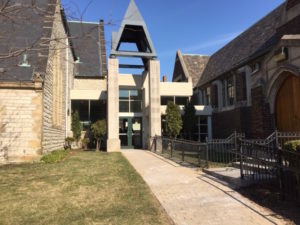 There is ample parking, free and guarded, in the surface lot beside the church, and in the larger surface lot at the rear of the church (across the street). Both lots are accessed from Woodbridge Street. On Sundays, you can enter the side parking lot directly from Jefferson Avenue. 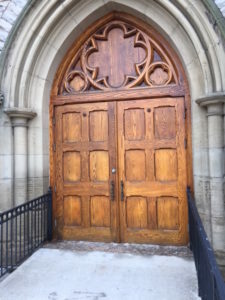 The large wooden front doors on Jefferson Avenue are also open on Sundays and for special events. 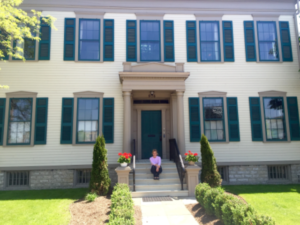 During office hours (Monday through Thursday, 9 am – 4:30 pm), use the Sibley House office entrance, which is located on the front side of the church, facing Jefferson Avenue. It looks like this, and you will need to ring the doorbell.